Large Dual Graphical LCD Displays moisture in wood and other building materials plus Air Temperature and Relative Humidity. Memory contains 3 wood groups and 4 building material. 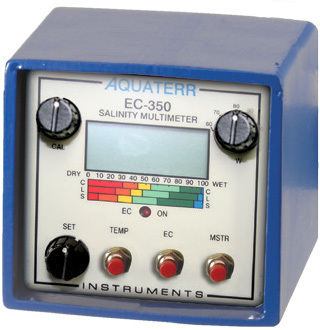 The Aquaterr 350 series of portable soil measurement instruments are widely used in rugged environments and are built to withstand industry abuse. 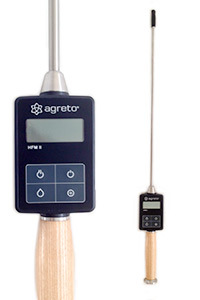 The super strong 30-inch aircraft grade T6 aluminum and stainless steel probe houses the sensors that measure Temperature, Moisture and Salinity. A weatherproof steel enclosure houses the electronics and easy to read display. Aquaterr Model EC 350-G is designed and ideal for pots and green-house work. 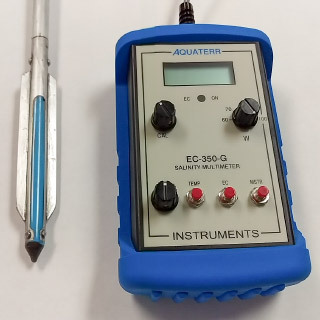 The only difference between EC 350-G and the EC-350 is that this is a handheld unit with a shorter probe suitable for depths from 4" to 12" [10 to 30cm]. The EC 350-G is quick and simple to use with no mucking around. Use it anywhere anytime. This unit measures soil moisture very rapidly and accurately. 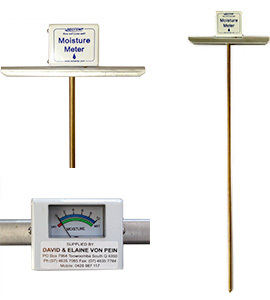 By pushing the needles into the soil surface or by digging a hole and pushing the prongs in to the bottom of the hole, the measurements are displayed directly in both raw mV and calibrated volumetric Soil Water Content [VSW%]. 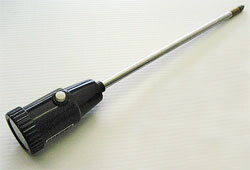 Extension tube for deeper holes - any depth down to 70 cm. 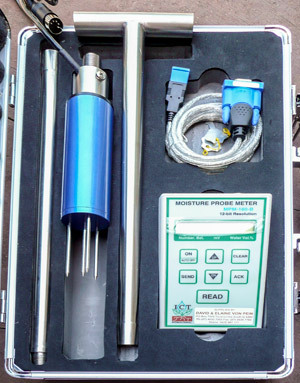 The MPKit soil moisture monitor probe comes complete in a sturdy aluminium case. Note: There is an optional auger kit available to drill 50 cm diameter holes down to whatever depth you want to 70 cm.